If you're building a modern SaaS solution for the Fortune 5,000,000, the importance of your marketing website cannot be overstated. 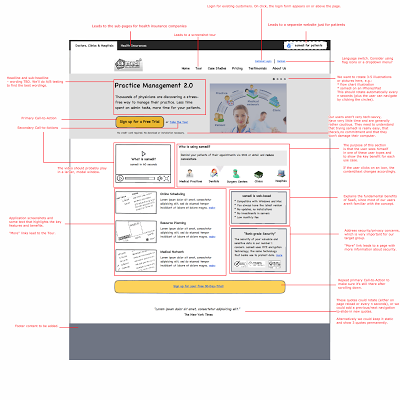 In the old world of enterprise software, most software vendors used to have pretty lame websites. Most of them were poorly designed and looked very technical and uninspiring, and the only images they contained were the seemingly obligatory stock photos (suit-wearing business people trying to out-smile each other, handshake close-ups and of course an attractive headset-wearing woman – often the same one on multiple vendors' sites!). Compare that with the website of a modern SaaS solution like Zendesk and I'm sure you'll understand what I mean. To be fair, those old-school software vendors were probably able to afford having bad websites since the Internet just wasn't their primary sales or marketing channel. 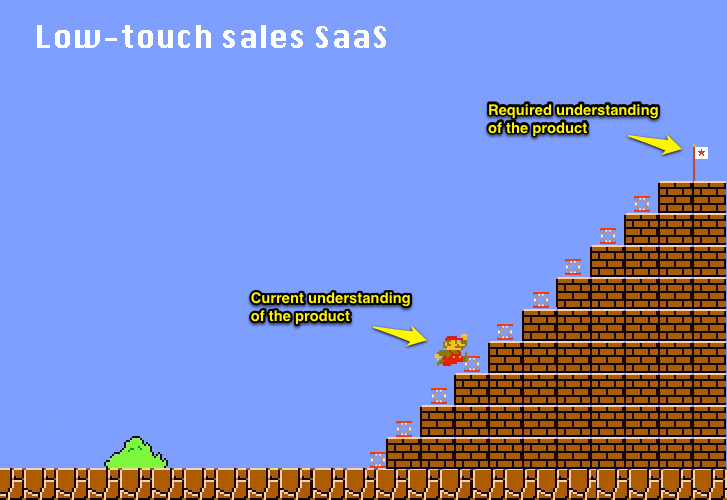 By contrast, if you market a SaaS application using a low-touch sales model, most of your customers will have very little interactions with your sales team, which turns your website into the face of your company. Use this as an opportunity to make your website your best marketing person! The primary objective that your website has to achieve is clear: attract as many visitors as possible (mainly by providing great content, more on that in a later post) and turn as many of them as possible into trial users. There can be a number of secondary goals like collecting email addresses of visitors who aren't ready to start a trial yet, generating interest from and providing information for partners, informing about job openings at your company, transporting your brand image and so on, but getting visitors to try your product is clearly the most important one. As such your site needs to combine a convincing, simple value proposition, which catches the visitor's attention and makes him want to learn more, with a clear and highly visible call-to-action (hello, AIDA). Looking at existing SaaS websites and my notes above will give you a good sense for the typical anatomy of a modern SaaS site, and since a lot of thinking and often A/B testing went into them you can deduce some best practices by analyzing these sites in detail. However, this shouldn't stop you from trying your own ideas and from trying something completely new. Keep it simple. Just like your product needs to allow for gradual discovery, your marketing website also needs to start with a simple, compelling value proposition and keep the more detailed information for the sub-pages. Interestingly, if you look at the evolution of popular SaaS sites you'll often notice that they got simpler and simpler over time. Example: This is how Basecamp looked like in 2006, and this is how it looks like today. I've mentioned secondary conversion options above. It's important that you offer something to visitors who are interested in your product but aren't ready to take a trial yet. It can be a newsletter subscription, a callback button, a whitepaper download, a live chat window or signing up for a webinar, to name some options. Ideally it allows you to get the visitor's email address so that you can reach out to the user later. This may not be relevant for you right after the launch, but at some point in time you should try to personalize your homepage based on information that is available about the visitor and see if it has a positive effect on conversion. One simple way to do this is to customize the page based on the user's location A site like Clio, for example, could use geo-targeting to tell a visitor from, say, New York how many lawyers from New York Clio has among its customer base already or show case studies from Clio customers in New York. Last August, Marc Andreessen wrote a great essay titled "Why software is eating the world". In his article, which got a lot of attention in the tech world, Marc explains why and how a variety of industries have been and continue to be disrupted by software. Read it if you haven't read it yet, it's a well-written and inspiring post by one of the most successful and knowledgable people in the Internet industry. Recently I read about the concept of "dematerialization" (in the book "Abundance – The Future Is Better Than You Think" by Peter H. Diamandis and Steven Kotler). The book quotes Bill Joy saying "We're seeing the tip of the dematerialization wave, like when a phone dematerializes a camera. It just disappears." and goes on to list a number of other goods and services that are now available with the average smartphone. Software is eating the world, but the smartphone is pretty hungry too. There's no real contradiction here though, since a large part of the smartphone's appetite for disruption is driven by software as well (although innovations in the hardware used by smartphones play an important role too). Either way, I think it's a fascinating observation. When I look at myself, my iPhone has already replaced my wristwatch, a pocket translator, a GPS running watch, a travel alarm clock, an address book, a calendar and an MP3 player. Most of the time it also replaces my camera, camcorder and calculator. For other people the smartphone has replaced radios, TVs, GPS navigators, flashlights, mobile game consoles, pocket mirrors and, in case you forgot that you can also use these thingies to make calls, landline phones. Soon the smartphone will dematerialize credit cards, loyalty cards, keys, and this is just what I came up with thinking about it while writing this blog post. I'm sure there are dozens or maybe hundreds of other products or services that are being eaten by the smartphone already or will be in the near future, and I'd love to hear your experiences or predictions in the comments below. It probably took most of us some time to really get it. But now we're getting it. 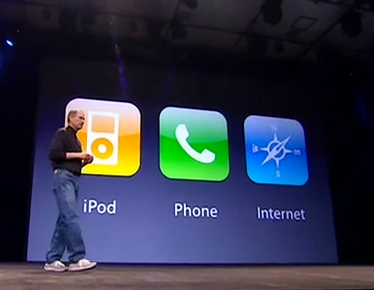 And it's not just three separate devices which the iPhone is replacing, it's dozens of devices. I've written about the topic before, so if you've read this post from early this year most of what I'm going to write now won't be new for you and you may want to skip this article. a great engineer who can code the application. The reason is obvious, you need to understand the problem that you are solving for your target customers, you need a product that looks good and feels good and can be sold online and last but not least, to say it how Dave McClure would probably say it, you need someone to get sh*t done. :) If you're a genius you might combine all of these threes qualities in one person, but it's more likely that you'll need a founder team of two or three persons to cover all three areas. What if you don't have that SaaS founder dream team – a CEO with domain expertise, a great CPO and a rock-star CTO? If you're only missing the domain expertise that may be comparably easy to acquire. In many (but certainly not all) markets you can probably learn a lot of what you need to know within a couple of months. If you don't have product and engineering knowledge that's tough. In my opinion you absolutely have to have this in the DNA of your company. Don't even think about outsourcing product design or engineering to an agency, I can almost guarantee you that it ain't gonna work. So if your founding team consists of five MBAs who've never built a product before, don't start a SaaS company, build an eCommerce business instead (there's nothing wrong with that either). With the exception of the developers (arguably), these hires can all be pretty junior people – young, smart, hungry people that learn fast. Later in the game you'll need people with a lot of experience, for example for the VP Sales role. But for most positions, most of the SaaS CEOs that I've talked to have a strong preference for "raw talent" and people with the right attitude. PS: As you know, this whole series is, and will continue to be for some time, a work-in-progress. Any comments or feedback is very welcome! Further to my post about my "1st DO for SaaS startups" (and again, in the spirit of releasing early and iterating fast) I'd like to touch on a few additional points with respect to the right market. If you want to go big and build a large, successful company it's obviously important that your market is big enough. How big is big enough? Most large VCs would answer that the TAM of a SaaS company should be at least $1B. The thinking is, if it's a $1B market and you grab 5-10% of it and get a revenue multiple of 5-8x, the company will be worth $250-800M at exit. This is where large VCs start to get excited. We as a small early-stage fund are a little more modest but we also want to see a clear potential for a $100M+ exit, which means there needs to be a clear potential to get to at least $10-20M in revenues. If you assume 5-10% market share, that means the TAM should be $100-400M at the minimum. Note that by TAM I mean your primary market. If there's potential to expand into new products or geographies that's great and can be a big plus, but given the uncertainty of these expansions it's important that your primary TAM alone is big enough. Can't you target a smaller market but aim for much bigger market share? The general thinking is that it's much easier to get to, say, $50M in revenues in a $1B market than in a $200M market. My gut tells me that's right, but it would be interesting to see some real data on this question. Note that I'm answering the question from my biased VC perspective. There are plenty of opportunities to build very respectable companies in smaller markets or niches. They just may not be VC-fundable – which can be completely fine if you don't need that much capital and if your competitors don't get VC funding either. Should you go after the Fortune 500 or the Fortune 5,000,000? At Point Nine we're big fans of the latter. To some degree that's just a personal preference. 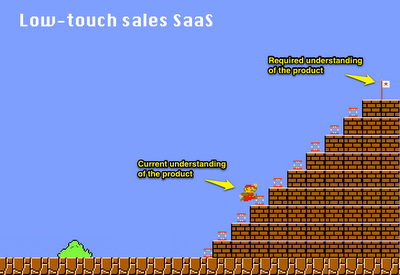 We don't have expertise in enterprise sales and we just love consumerized, low-touch sales SaaS businesses. Some of the most valuable software companies have been built based on the enterprise sales model (including SAP, probably the most successful high-tech company coming out of Germany in the last 40 years) and maybe that's still possible. It's just not our thing. You need less time and money to get a first version to the market. The lean startup approach doesn't work well for enterprise software as you need to invest much more money into product development and sales. When you develop for enterprise clients there's a risk that you become a victim of the law of small numbers: You develop your product based on the requirements of a handful of pilot customers but you don't know if the rest of the market has the same needs. When you target SMBs you'll develop and iterate your product based on the needs of a much bigger sample size. The same goes for the sales side: Because you're dealing with small numbers it's easy to draw wrong conclusions. For example, you may think that you have a great CAC/CLTV ratio and all you have to do is hire more salespeople whereas in reality you just had luck with a few good customer wins. 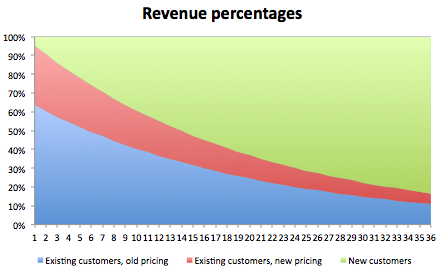 Customer acquisition is much less sales-driven, which means that you need less capital and that you can grow faster. And finally, starting with SMBs doesn't prevent you from going upstream over time. As your product becomes more and more robust and you understand the needs of bigger clients better and better you can target increasingly bigger customers. Much better than doing it the other way round since it's very hard to take an enterprise product and strip down features to make it usable for SMBs. 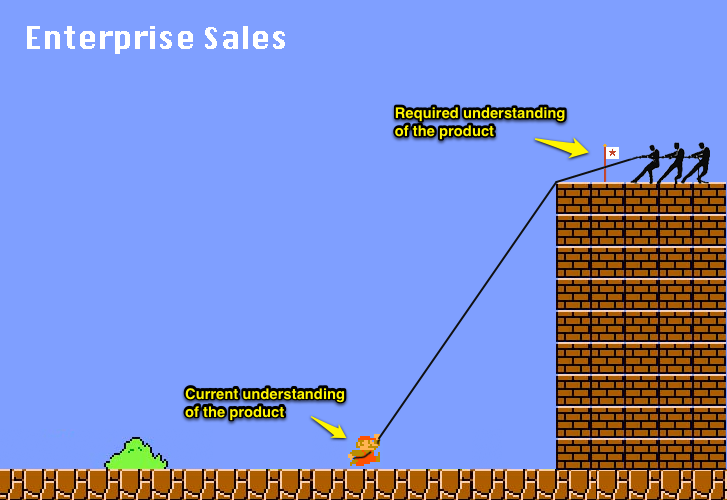 The advantage of a vertical product, i.e. a product made for a particular industry, is that you know exactly who your target customers are. That makes it much easier to find out the precise needs of your target customers and also makes your marketing efforts easier. The downside of a vertical product is that your niche might not be very large and you might struggle to expand into other verticals. For horizontal products it's usually the other way round: Bigger TAMs, but it may not be obvious who the first adopters of your product are and it's harder to reach potential customers in a targeted way. One of the most important tools to better understand the usage of a web application – or a service, a game or a mobile app, it doesn't matter – is a cohort analysis. In fact, it's almost impossible to get a really good understanding of a service's usage without looking at activity and retention numbers on a cohort-by-cohort basis. And yet, most startups that we're talking to haven't looked into cohort analyses yet. Often the reason is lack of resources. If you're a young, bootstrapped startup and you have to decide if you want to use your developers' scarce time to improve your product or to get better statistics most founders will decide for the product. That's understandable. Nonetheless I would like to argue for a high quality standard of metrics early on, since the insights that you'll get by understanding your metrics will often be highly actionable. And of course it will make your conversations with investors who want to understand your numbers much easier. At the minimum, I think you should try to make sure from the beginning that you collect the data that will allow you to do more sophisticated analyses later. 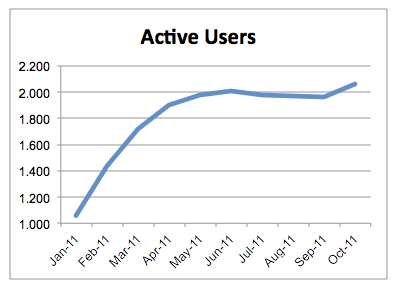 It looks like the number of active users is growing even steeper. Great! 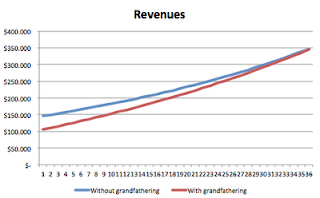 But now let's take a look at the underlying cohort numbers in this Google Sheet. The number of new signups are contained in cells D5 to D14, and the cumulated number of signups are in cells E5 to E14 (I used that one to make the chart look better :-) ). The number of active users, which the second chart shows, is contained in cells H15 to Q15. Each row represents a signup cohort. In the "right-aligned" cohort analysis at the top you can see the number of active users of each signup cohort for every calendar month. 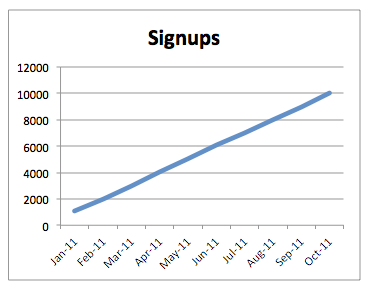 So, for example, I5 is the number of users who signed up in January 2011 and were active in February 2011, and I6 is the number of users who signed up in February 2011 and were active in February 2011. Accordingly, if you go down to the "Total" numbers in row 15 you'll see the total number of active users for each calendar month. These are the numbers which form the activity chart above. In the "left-aligned" cohort analysis at the bottom you can see the number of active users of each signup cohort for every user lifetime month. 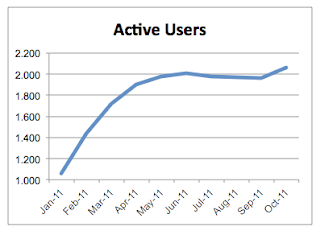 Example: I20 shows the number of users who signed up in February 2011 and were active in March 2011 (=user lifetime month #2 of the February 2011 cohort). Row 29 and 30 calculate the monthly drop-off rate and the percentage of users who is still active n months after signing up. Here's where it gets really interesting. Our imaginary startup has a monthly drop-off rate of 50%, which means that after 6 months only 4% of the users are still active! That's not easy to see if you're just looking at the charts above, is it? Note: In the example that I'm using, a user who registers in month x qualifies as an active user in that month. The assumption is that he logs in at least once after registration and that that log-in makes him count as an active user. That effect completely distorts the real activity numbers. If you're signing up a growing number of users it means that your activity numbers can basically only go up regardless of any real usage activity. So - if you're talking about "active users" it's best to leave out the users who have signed up in the timeframe that you're talking about. That is, if you're talking about the number of active users from last week, include only the users who signed up until the week before. By the way, while I've used "activity" in this example you can of course use cohort analyses to track other aspects, too. As a SaaS company, for example, you should have a cohort analysis for retention/churn. As an online shop, you should have a cohort analysis for repeat purchases. About one and a half years ago I became a vegetarian, after coming to the conclusion that it's impossible to ethically justify to kill – and in almost all case inflict enormous suffering on – living creatures that are capable of experiencing pain, just for the pleasure of eating meat (which, make no mistake about it, is a huge pleasure). Maybe I'll write more about that topic in another post. In the meantime, if you're interested in the rationale behind my decision, read Jonathan Safran Foer's bestseller "Eating Animals" or the hard to swallow but brilliant books of Peter Singer. Today I want to write about different kinds of animals (sorry for the misleading introduction). I'm talking about business development animals. Coding animals. Usability animals. Design animals. Sales animals. Marketing animals. In short: Founders who work like beasts to make their startups successful. When I read Paul's essay "How to start a startup" again a few days ago, I thought about the founders of the companies that I've invested in and was struck by how much truth there is in the "animal test". What all successful founders seem to have in common is perfectionism at what they're doing, coupled with a relentless drive. I had to think about my old friend Stefan Smalla, who, less than one year after founding, has rolled out Westwing to fifteen countries while managing spectacular growth in Germany at the same time. I also had to think about Guk Kim and Ryan Fyfe, the founders of Cibando and Shiftplanning, respectively. Both are in their mid-twenties and started their companies all by themselves, did everything by themselves in the early days and are now doing an incredible job at running and scaling their companies. These are just three examples – I could go on and on and talk about every founder that I've invested in! In the meantime, the "animal test" has become something like a running gag here at Point Nine Capital. Whenever we talk about a potential investment we're asking ourselves: Are these guys animals? How does the ideal SaaS startup founder team look like? 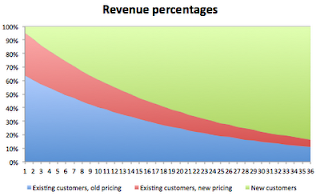 In general terms, what is the ideal size and make-up of a team for a pre-revenue SaaS startup? It's a question I've been pondering about a lot already, and seeing it posted on Quora prompted me to try an answer. I think the second part of the question is more important. I do have a slight preference with respect to the team size as well, but it's light because I've seen and worked with very successful SaaS startups with different team sizes. I have a stronger opinion on the make-up of the team. In my opinion, the founder team of a SaaS startup needs to excel in three areas: engineering/technology, product/UX and domain/market expertise. If I think about the founders of "my" SaaS startups, these are the three qualities that all of them have – in addition to a huge amount of intelligence, motivation and commitment, which allows them to quickly acquire new skills as the company grows. In my experience the ideal team size is three. The second best option is two, and the third best option is one, four or five. Why? To begin with, founders are incredibly productive and usually work for relatively little cash, so a 3-person founder team simply gets more done – faster and at lower costs – than a 2-person team or a single founder. This can be a huge advantage, especially for a bootstrapped startup that can't afford to hire many people. Besides that, it’s rare to find all the skills that you need in order to get a SaaS startup off the ground in just one person, which is an argument for two or more founders (more on that below). Needless to say, at a certain level these advantages get offset by the disadvantages of a founder team that is too large. If you have too many founders, too much time is spent on communication, and each founder doesn't get a big enough share in the company. In my opinion, the optimal balance is reached with a team of three, closely followed by a team of two. Note that this is not a scientific answer, and I haven’t done a systematic comparison of the success rates of a larger number of startups – it’s just based on intuition and anecdotal evidence. Also, I have already invested in 1-person and 2-person founder teams, which became very successful, so my preference is only a light one. An excellent technical co-founder– a great developer who codes the first version of the product and has the skills to become the engineering team leader or CTO when the company grows. An excellent product person – for example a great designer who designs the UI of the application as well as the marketing website and who will lead product management later. Domain expertise – whether it’s the CTO, the product person or a third co-founder who contributes this knowledge – at least one founder needs to understand your market, your customers and the problem that you’re solving for them. Sales and marketing expertise and general management experience can be a big plus of course and are very important in later stages of the company, but in the beginning they aren’t as essential as the three requirements mentioned above. You can hire people for sales and marketing later and you can acquire management experience or hire additional people over time. But first you have to create a product that solves a real need for your customers – and the ability to do that needs to be part of the founder team’s DNA. It's that time of the year – you're looking back to the old year and you're reviewing your plans for the new one. The last year was very busy for me, both privately and professionally. 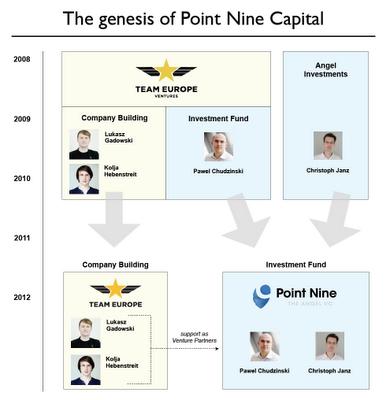 I became a dad for the third time, and I teamed up with Team Europe to create Point Nine Capital. Two startups, so to speak. Before 2011 I've had 2 write-offs. In 2011 there were 0 write-offs, which means that the total number of active investments is 26. 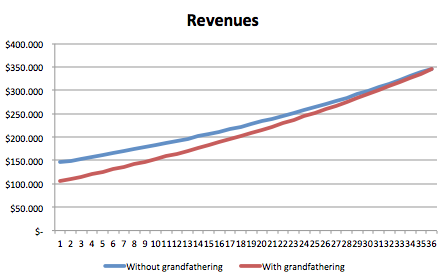 My ROI (on paper) stands at a little over 5x if you use the last rounds' valuations as the estimated fair-market value. If you try to factor in the increase in valuation since some of these last rounds, which in some cases happened over a year ago, it's probably closer to 8-10x. My portfolio is way too young to draw any final conclusions but it's obviously looking very good so far. Huge thanks go to all the incredibly talented and hard-working people at each of the 26 companies. Have a great New Year! Our last investment in the old year is a novelty for us – our first investment in a startup from Italy. Founded by 23 year old entrepreneur Guk Kim, Cibando operates a popular iPhone app that makes it easy to find the best restaurants in Rome, Milan, Florence and other Italian cities. What makes this significant (beyond its obvious significance for Cibando and for us) is that this is one of only a very small number of VC investments in Italy. So significant, at least, that the news got covered by TechCrunch and also made it to the online frontpage of Corriere della Sera, one of Italy's oldest and most reputable daily newspapers! To say that Italy's early-stage funding ecosystem is underdeveloped is probably an understatement, at least that's what I've heard in the last few months. Not that it's that great in Germany, although with the rise of Berlin as Europe's new tech hub it's hopefully getting better. But in Italy it seems to be much worse – so bad that many of the serious Internet entrepreneurs from Italy leave their country to raise money elsewhere. It might seem odd that we as a Berlin-based VC invest in Italy, but part of our strategy is to be somewhat location-agnostic. While the majority of our portfolio companies are based in Germany or Poland (homeland of Pawel and Lukasz) we're open to investing in other European countries and even outside of Europe. 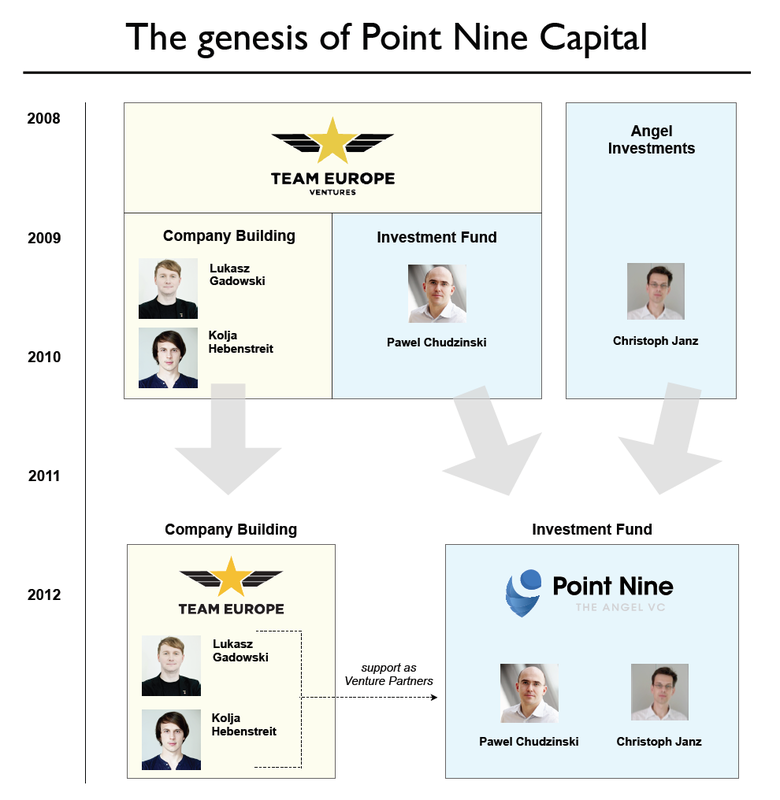 In fact, some of the best investments that Point Nine Capital (and/or I as an angel investor) made were in pretty unusual locations: myGengo (founded in Tokyo), Vend (founded in New Zealand), Zendesk (founded in Copenhagen) or Clio (founded in Western Canada) are great examples. Some of these companies later moved part or their operations to the US or even relocated completely, but that's another story. Back to Cibando. You simply draw a circle on a map to select how far you’re willing to drive and select your preferred restaurant category. Cibando then lists the best restaurants that match your requests, along with reviews, mouth-watering photos and other helpful information. Think of it as a mobile version of Yelp or Qype but with several special twists. Buon appetito!